Easy Social Share Buttons or shortly ESSB is a popular social sharing plugin for WordPress. It offers exhaustive sharing options for users to make your site popular in social media. We used this plugin for almost a year on our site. And here is a genuine review of easy social share buttons for WordPress plugin based on our experience. The plugin is offered through codecanyon for the price of $19. The price includes single site license and free support for first six months. Further support can be extended for a year by paying additional $5.63. So once you purchase the plugin, try to setup and resolve all your issues within six months. It has been sold to more than 19k customers and almost has 5 stars rating on codecanyon. In our opinion, the price is cheap comparing to the huge features list offered by the plugin. Once purchased the plugin, download the installation files and install it on your WordPress site. Navigate to the menu “Easy Social Share Buttons > Activate” and register your site using the purchase code downloaded from codecanyon. The plugin can be updated directly from your WordPress admin panel similar to any other plugins downloaded from the repository. This is a all in one social plugin allows you to add share buttons, follow us profiles, subscribe forms and click to tweet option. There are two ways to setup social icons for your site – quick setup and detailed setup. Quick setup offers all the options in a single screen while detailed setup is like a wizard navigating to multiple screens. We would recommend starting with quick setup and then going with detailed setup once you are familiar with the plugin options. Quick setup has eight steps as shown below. It starts from choosing the template, style and networks to setup the position. Ensure to setup proper display of icons on mobile. For example, when you choose the “Post Vertical Float” option then you should customize the icons separately for mobile device to avoid showing floating icons. Detailed setup of social icons is a lengthy process and requires you to navigate to menu by menu. Select the template of social icons from “Social Sharing” menu. Once the template is chosen, select the position and choose the post types for enabling social icons. You can customize the icons differently on different post types as per your need. You can also choose the layouts from the menu “Ready Made Styles”. Social profile links can be added easily under “Like, Follow & Subscribe” menu. It further allows you to activate the profile widget and enable shortcode embedding. 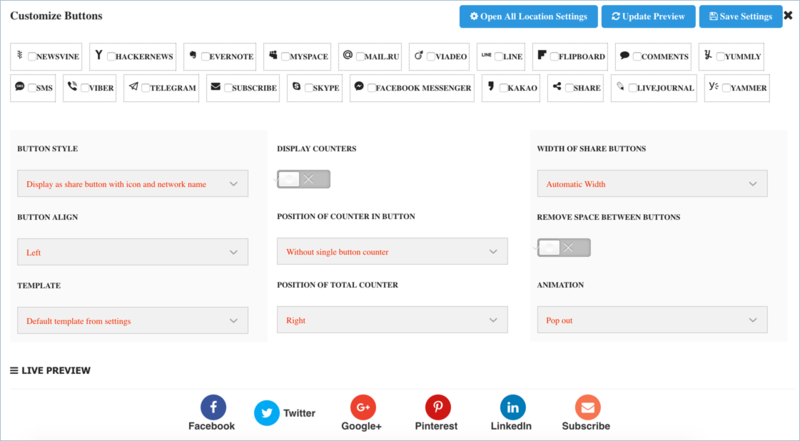 The plugin can also create an automatic custom sidebar with the social profile links. In addition to social sharing and profiles, the plugin offers email popup extension for free. You can find the available extensions under “Extensions” section and install it. Once installed the required options will be added under the menus “Like, Follow & Subscribe” and “[Addon] Optin forms in content”. Seven templates available for selecting the email popup. Connection to seven popular email marketing service providers like MailChimp, CampaignMonitor and MailPoet are available. You can choose double opt-in option to avoid spam subscriptions. Again there are exhaustive options available under these settings menus. Basically you can fine-tune the performance by adjusting the script loading under advanced settings. Also you can deactivate some modules, do translations and customize the administrative settings. Under style settings you can customize colors and add additional custom CSS. Insert social icons within content and widget area by creating custom shortcodes for the styles you need. You can customize the shortcode by following the process similar to quick setup. The plugin has two ways to track the clicks on the social buttons. Once is inbuilt analytics which will allow you to see the statistics in a graphical and table manner. You can view the stats by display positions, networks and popular posts. The support process of Easy Social Sharing Buttons for WordPress plugin is similar to most of the other plugins sold through codecanyon. You can read the documentation and raise a support ticket from the developer website. It needs separate registration and login every time for addressing your issues. The support is nominal category to answer the queries in a day or two. Version 4.2 of the plugin brings many additional features. One of them is a live online customizer which will allow you to modify the settings on the page instead of the navigating through different menu items. 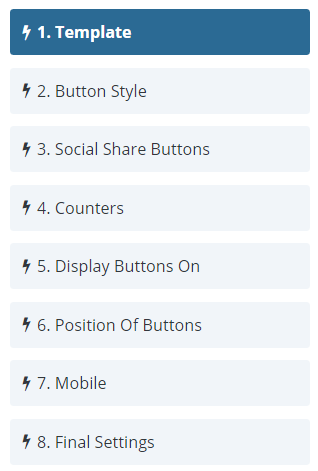 Easy Social Sharing Icons for WordPress plugin definitely does what it says and offers tons of layouts and positioning options. But it’s a fact that the user interface is congested and difficult to find the location of important settings. Also the plugin will add huge inline code and affect the page loading speed. We recommend to buy the plugin when you decided to make use of it completely and improve the popularity of your site through social route. Nice review. What is your verdict between this plugin and social warfare? We recommend ESSB – with the 4.2 version it has lots of different options.